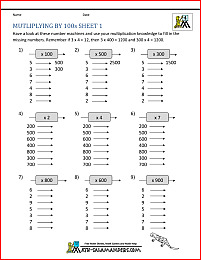 Welcome to the Math Salamanders Multiplication Printable Worksheets. Here you will find a wide range of free printable Multiplication Worksheets which will help your child improve their multiplying skills. 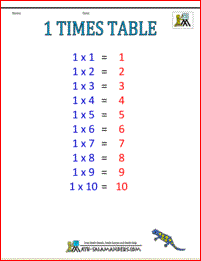 Take a look at our times table worksheets, or check out our multiplication games or some multiplication word problems. Once children have mastered place value to 100, and learn to count in steps of 2, 5 and 10, they are ready to start multiplication. Multiplication follows on naturally from counting in steps of different sizes. When children first learn multiplication, the learning is linked to addition which they are already very familiar with. So 2 + 2 + 2 + 2 becomes 2 four times or 2 x 4 (or 4 x 2). Once children have understood what multiplication is, they are then ready to start learning their tables, learning to multiply by one or two digit numbers, and then applying their knowledge to solve problems. At the very last stage in elementary math, they are ready to start multiplying decimals. 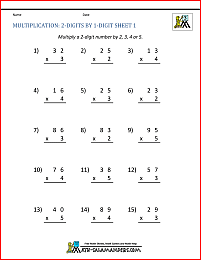 The multiplication printable worksheets below will take your child through their multiplication learning step-by-step so that they are learning the math skills to move on to the next step, as well as starting off at a nice easy level to gain confidence. Here you will find our selection of free resources such as flashcards, multiplication charts and grids to help your child to learn their multiplication facts. All the free Math flash cards in this section are informed by the Elementary Math Benchmarks for 2nd and 3rd Grade. 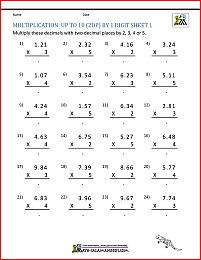 The multiplication printable worksheets below will support your child with their multiplication learning. 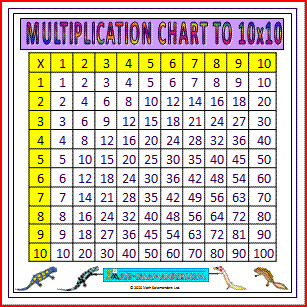 These Multiplication Printable Worksheets below are designed to help your child improve their ability to multiply a range of numbers by multiples of 10 and 100 mentally. The following sheets develop children's ability to use and apply their tables knowledge to answer related questions. All the free Math sheets in this section are informed by the Elementary Math Benchmarks for 4th Grade. These Multiplication Printable Worksheets below involve children using their multiplication table facts to answer related questions involving decimals. Before your child tries written multiplication methods involving decimals, they should be confident using their multiplication table facts to multiply simple decimals mentally. 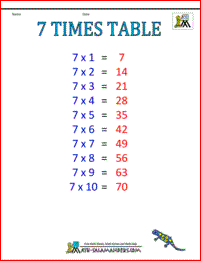 use their multiplication tables to answer related facts involving decimals up to 2 decimal places (2dp). All the free Math Worksheets in this section are informed by the Elementary Math Benchmarks for 5th Grade. 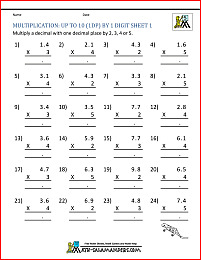 Here is our free generator for multiplication (and division) worksheets. Here you will find a selection of Written Multiplication sheets designed to help your child improve their ability to use a written method to multiply two numbers together. As your child progresses through the grades, they will learn to multiply a 2 digit number by a single digit, then progress on to multiplying multi-digit numbers by a single digit. Once they are confident multiplying by a single digit, they can start to multiply multi-digit numbers by 2 digits, and then progress on to multiplying by decimals and money amounts. 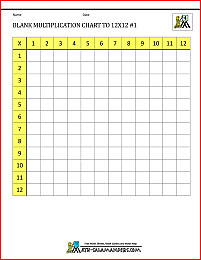 Here you will find a range of written multiplication printable worksheets. This is the first introduction of a written multiplication method at this stage. The following sheets develop children's ability to use a written method to multiply a multi-digit number by a single digit, starting off at a very basic level. learn to multiply a multi-digit number by a single digit. All the free Math sheets in this section are informed by the Elementary Math Benchmarks for 3rd Grade. 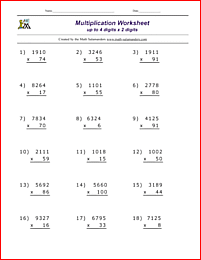 Here you will find our 4th Grade Multiplication Printable Worksheet collection. These sheets are designed to help your child improve their ability to multiply a range of numbers by a two digit number. multiply a range of 2 and 3 digit numbers by two digits. Our free 5th Grade Multiplication Printable Worksheet collection below is designed to help your child improve their ability to multiply a range of numbers involving decimals by a single digit. 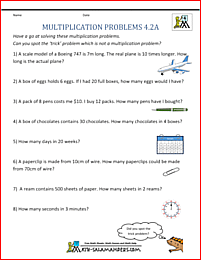 We have a range of Multiplication Word Problem worksheets. Each sheet comes in different levels of difficulty so that you can select an appropriate level for your child/class. solve a range of problems, including 'real-life' problems.